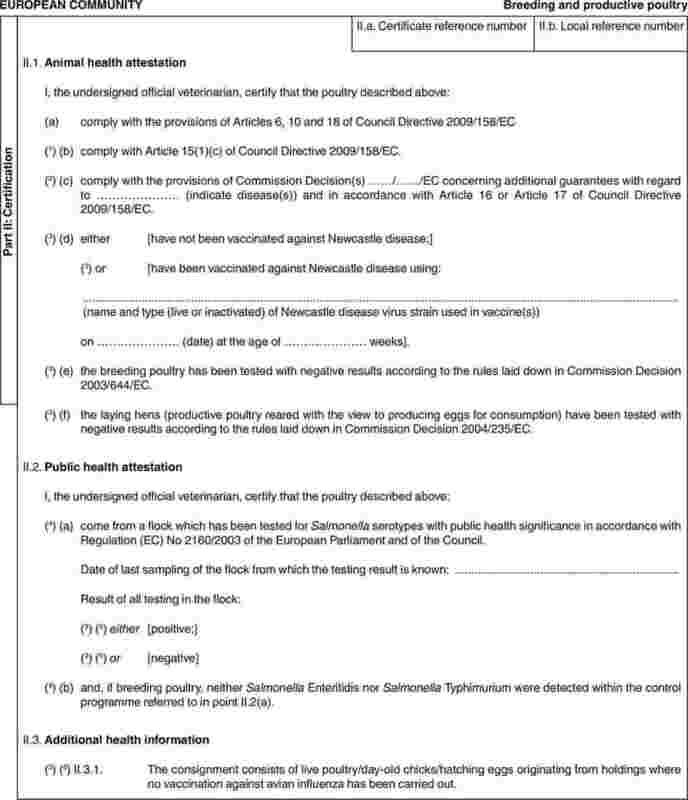 Council Directive 90/539/EEC of 15 October 1990 on animal health conditions governing intra-Community trade in, and imports from third countries of, poultry and hatching eggs (2) has been substantially amended several times (3). In the interests of clarity and rationality the said Directive should be codified. Poultry, being live animals, and hatching eggs, being animal products, are included in the list of products in Annex I to the Treaty. In order to ensure the rational development of poultry production, thereby increasing productivity in that sector, certain animal health rules governing intra-Community trade in poultry and hatching eggs should be laid down at Community level. The breeding and rearing of poultry is included in the farming sector. It constitutes a source of income for part of the farming population. In order to encourage intra-Community trade in poultry and hatching eggs, there should be no disparities as regards animal health conditions in the Member States. In order to encourage the harmonious development of intra-Community trade, a Community system should be laid down to govern imports from third countries. The provisions of this Directive should not, in principle, apply to specific trade such as exhibitions, shows and contests. In view of the nature of modern poultry farming, the best way to promote the harmonious development of intra-Community trade in poultry and hatching eggs is to monitor production establishments. It should be left to the competent authorities of the Member States to approve establishments which satisfy the conditions laid down in this Directive and to ensure that the conditions are applied. Council Regulation (EC) No 1234/2007 of 22 October 2007 establishing a common organisation of agricultural markets and on specific provisions for certain agricultural products (Single CMO Regulation) (4) provides for the marketing standards for products of the eggs and poultrymeat sectors. Commission Regulation (EC) No 617/2008 of 27 June 2008 laying down detailed rules for implementing Regulation (EC) No 1234/2007 as regards marketing standards for hatching eggs and farmyard poultry chicks (5) lays down detailed rules for implementing that Regulation as regards marketing standards for hatching eggs and farmyard poultry chicks, and in particular as regards the granting of a distinguishing number to each production establishment and for the marking of hatching eggs. For practical reasons, the same criteria for identifying production establishments and marking hatching eggs should be adopted for the purposes of this Directive. Member States should designate the national reference laboratories and provide all the necessary details and updates. Member States should make that information available to the other Member States and the public. In order to be the subject of intra-Community trade, poultry and hatching eggs should satisfy certain animal health requirements, so as to avoid the spread of contagious diseases. Transport conditions should be laid down for the same reason. Provision should be made for allowing the Commission to approve certain additional requirements in the light of the progress made by a Member State in eradicating certain poultry diseases, provided that those requirements in no case exceed those applied nationally by the Member State concerned. In this context, it could prove desirable to determine the status of the Member States or regions thereof with regard to certain diseases likely to affect poultry. Although intra-Community trade transactions in very small quantities cannot, for practical reasons, be subject to all the Community requirements, certain essential rules should be complied with. To ensure that the prescribed requirements are satisfied, provision should be made for the issue by an official veterinarian of a veterinary certificate to accompany the poultry and hatching eggs to their destination. 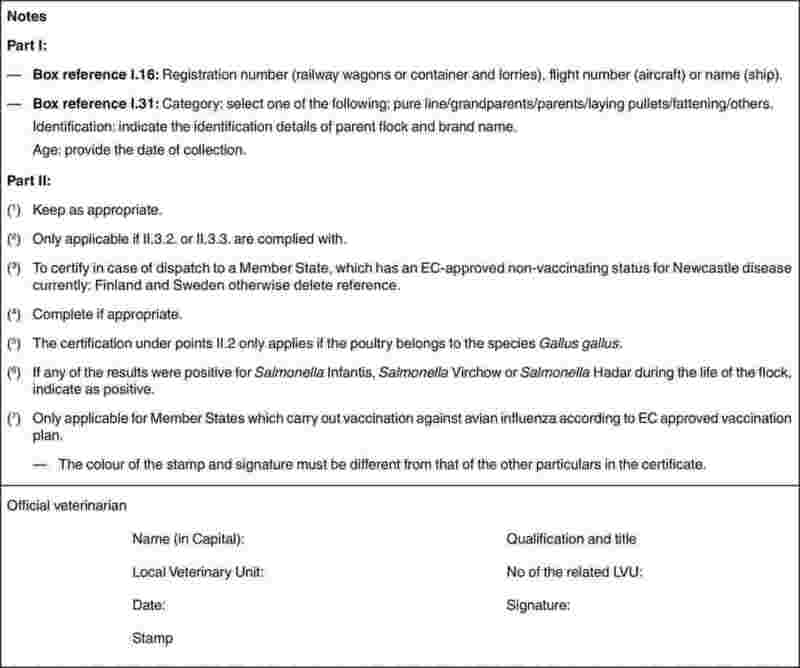 In respect of the organisation of, and the follow-up to, the checks to be carried out by the Member State of destination and the safeguard measures to be implemented, reference should be made to the general rules laid down in Council Directive 90/425/EEC of 26 June 1990 concerning veterinary and zootechnical checks applicable in intra-Community trade in certain live animals and products with a view to the completion of the internal market (6). Provision should be made for checks to be carried out by the Commission in cooperation with the competent authorities of Member States. 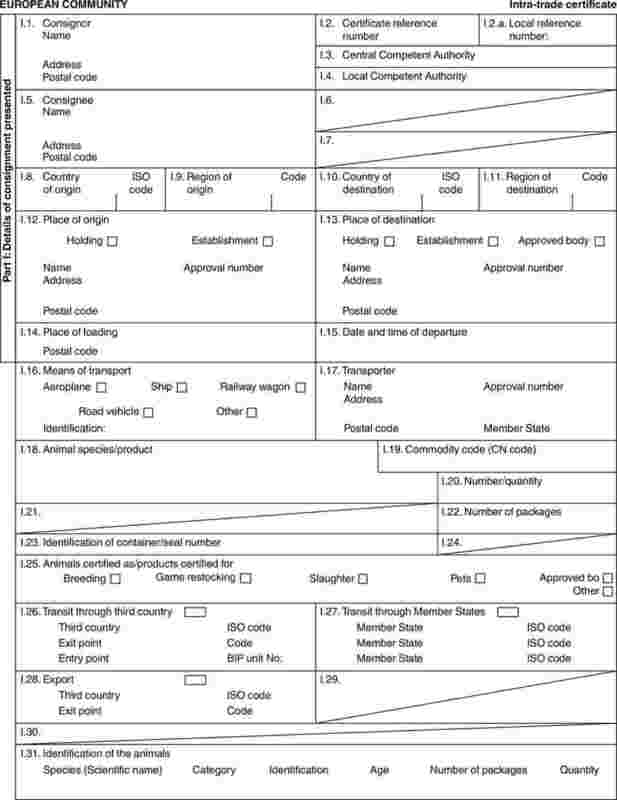 Defining Community arrangements applicable to imports from third countries requires a list to be drawn up of third countries or parts of third countries from which poultry and hatching eggs may be imported. The choice of those countries should be based on criteria of a general nature such as the state of health of the poultry and other livestock, the organisation and powers of the veterinary services and the health regulations in force. In addition, importation of poultry and hatching eggs should not be authorised from countries which are infected with contagious poultry diseases presenting a risk to Community livestock or which have been free from such diseases for too short a period. The general conditions applicable to importation from third countries should be supplemented by special conditions drawn up on the basis of the health situation in each of them. The presentation of a standard form of certificate upon importation of poultry and hatching eggs constitutes an effective means of verifying that the Community rules are being applied. Such rules may include special provisions which may vary according to the third country concerned. This should be taken into account in drawing up the standard forms of certificate. Commission veterinary experts should be responsible for verifying that the rules are observed in third countries. The checks carried out upon importation should cover the origin and the state of health of the poultry and hatching eggs. Member States should be allowed, on the arrival of poultry and hatching eggs in the territory of the Community and during transit to their place of destination, to take all measures, including slaughter and disposal, required for the purpose of safeguarding public and animal health. The constant development of poultry-rearing techniques means that periodic changes in the methods of poultry disease control will have to be made. The measures necessary for the implementation of this Directive should be adopted in accordance with Council Decision 1999/468/EC of 28 June 1999 laying down the procedures for the exercise of implementing powers conferred on the Commission (7). 1. This Directive lays down animal health conditions governing intra-Community trade in, and imports from third countries of, poultry and hatching eggs. 2. This Directive shall not apply to poultry for exhibitions, show or contests. For the purposes of this Directive ‘official veterinarian’ and ‘third country’ mean the official veterinarian and third countries as defined in Council Directive 2004/68/EC of 26 April 2004 laying down animal health rules for the importation into and transit through the Community of certain live ungulate animals (8). ‘sanitary slaughter’ means the destruction, subject to all the necessary health safeguards including disinfection, of all poultry and products which are infected or suspected of being contaminated. 1. 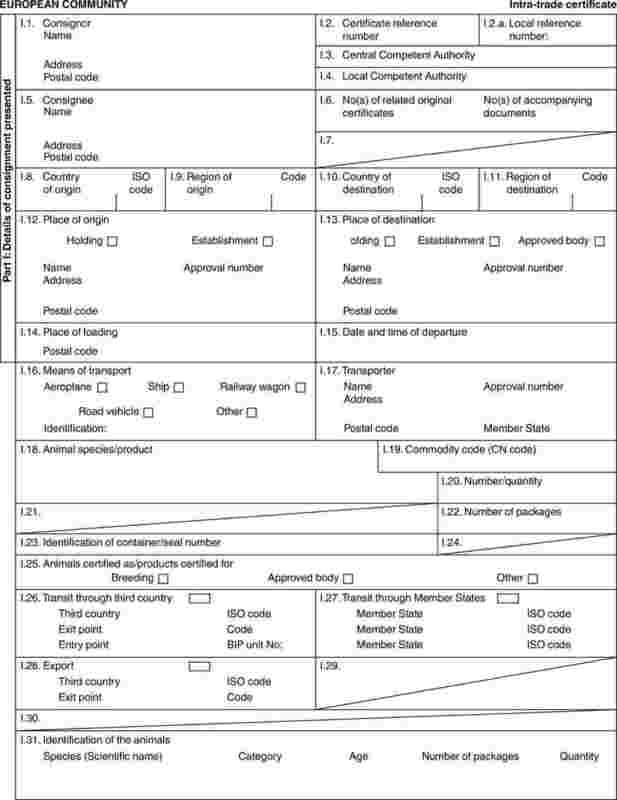 Member States shall submit to the Commission by 1 July 1991 a plan describing the national measures which they intend to implement to ensure compliance with the rules set out in Annex II for the approval of establishments for the purposes of intra-Community trade in poultry and hatching eggs. The Commission shall examine the plans. In accordance with the procedure referred to in Article 33(2), those plans may be approved, or amendments or additions made, before approval is given. requested, in order to take account of progress in methods of disease prevention and control. Each Member State shall designate a national reference laboratory to be responsible for coordinating the diagnostic methods provided for in this Directive and their use by the approved laboratories located in its territory. Each Member State shall make the details of its national reference laboratory, and any subsequent changes, available to the other Member States and to the public. Detailed rules for the uniform application of this Article may be adopted in accordance with the procedure referred to in Article 33(2). hatching eggs, day-old chicks, breeding poultry and productive poultry shall satisfy the conditions laid down in Articles 6, 15, 18 and 20. They shall also satisfy any conditions laid down pursuant to Articles 16 and 17.
as regards salmonella, poultry intended for Finland and Sweden shall fulfil the conditions laid down pursuant to Article 13.
a flock which at the time of consignment presents no clinical sign or suspicion of contagious poultry disease. Each Member State shall draw up and keep up-to-date a list of establishments approved in accordance with point (a)(i) of Article 6 and their distinguishing numbers, and shall make it available to the other Member States and to the public. have been disinfected in accordance with the instructions of the official veterinarian. 2. If contagious poultry diseases which may be transmitted through eggs develop in the flock which supplied the hatching eggs during the period of their incubation, the hatchery involved and the authority or authorities responsible for the hatchery and the flock of origin shall be notified. present, at the time of consignment, no suspicion of diseases on the basis of Annex II, Chapter II, B2(g) and (h). have been submitted to a health examination by an official veterinarian or authorised veterinarian during the 48 hours preceding consignment and, at the time of the examination, have presented no clinical sign or suspicion of contagious poultry disease. which is not located in an area which for animal health reasons is subject to restrictive measures in accordance with Community legislation as a result of the outbreak of a disease to which poultry is susceptible. which is not located in an area which for animal health reasons is subject to prohibition in accordance with Community legislation as a result of an outbreak of disease to which poultry is susceptible. 2. Article 6 shall not apply to the poultry referred to in paragraph 1. 1. 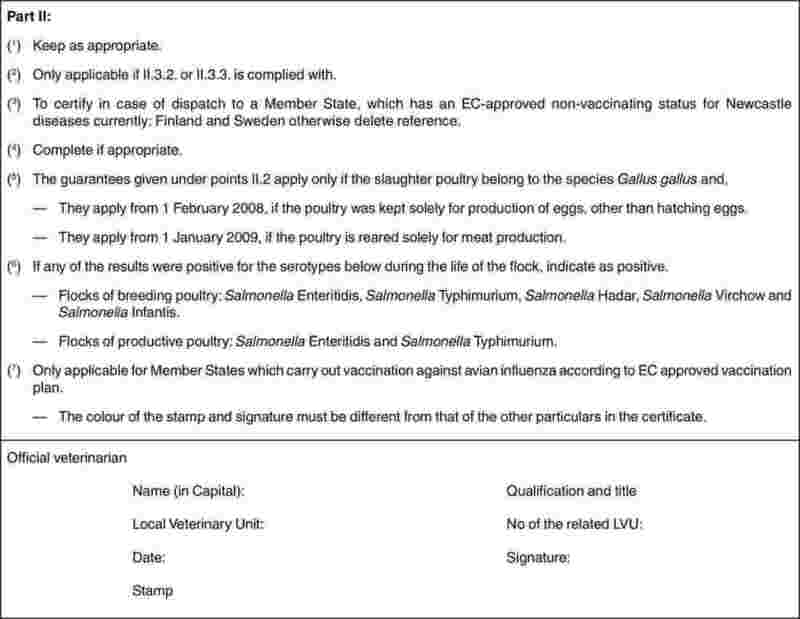 As regards salmonella and in respect of serotypes not mentioned in Annex II, Chapter III(A), consignments of poultry for slaughter for Finland and Sweden shall be subject to a microbiological test by sampling in the establishment of origin in accordance with Council Decision 95/410/EC of 22 June 1995 laying down the rules for the microbiological testing by sampling in the establishment of origin of poultry for slaughter intended for Finland and Sweden (10). 2. The range of the test referred to in paragraph 1 and the methods to be adopted shall be determined in the light of the opinion of the European Food Safety Authority and of the operational programme which Finland and Sweden must submit to the Commission. 3. The test referred to in paragraph 1 shall not be carried out for slaughter poultry from a holding subject to a programme recognised as equivalent to that referred to in paragraph 2 in accordance with the procedure referred to in Article 33(2). 1. The requirements of Articles 5 to 11 and 18 shall not apply to intra-Community trade in poultry and hatching eggs in respect of consignments comprising fewer than 20 units provided that they comply with paragraph 2 of this Article. are not located in an area which for animal health reasons is subject to restrictive measures in accordance with Community legislation as a result of an outbreak of disease to which poultry is susceptible. All birds in the consignment shall have been found negative in serological tests for Salmonella pullorum and Salmonella gallinarum antibodies, in accordance with Annex II, Chapter III, in the month preceding the consignment. In the case of hatching eggs or day-old chicks, the flock of origin shall be tested serologically for Salmonella pullorum and Salmonella gallinarum in the three months preceding the consignment at a level which gives 95 % confidence of detecting infection at 5 % prevalence. 3. The provisions of paragraphs 1 and 2 shall not apply to consignments containing ratites or hatching eggs of ratites. 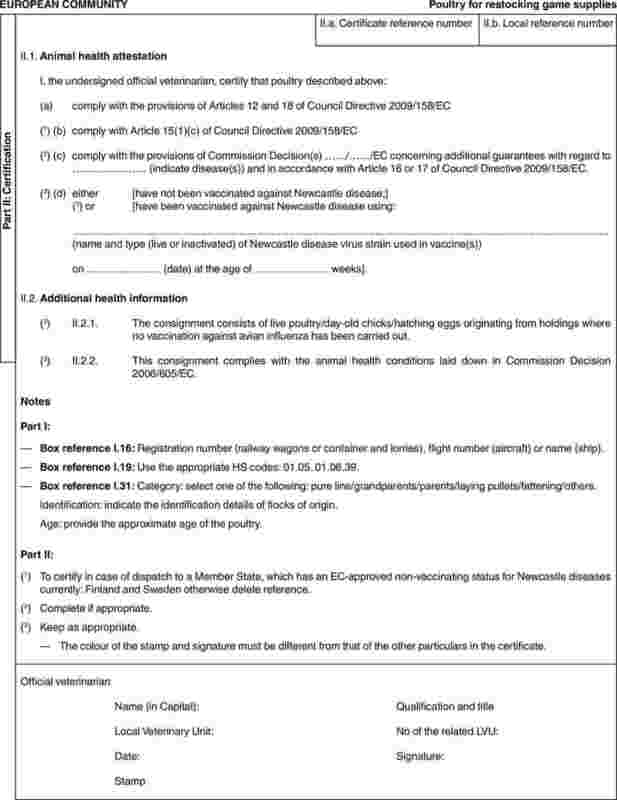 if vaccinated, have undergone, during the 14 days preceding consignment and on the basis of a representative sample, a test to isolate Newcastle disease virus complying with detailed rules adopted in accordance with the procedure referred to in Article 33(2). 2. 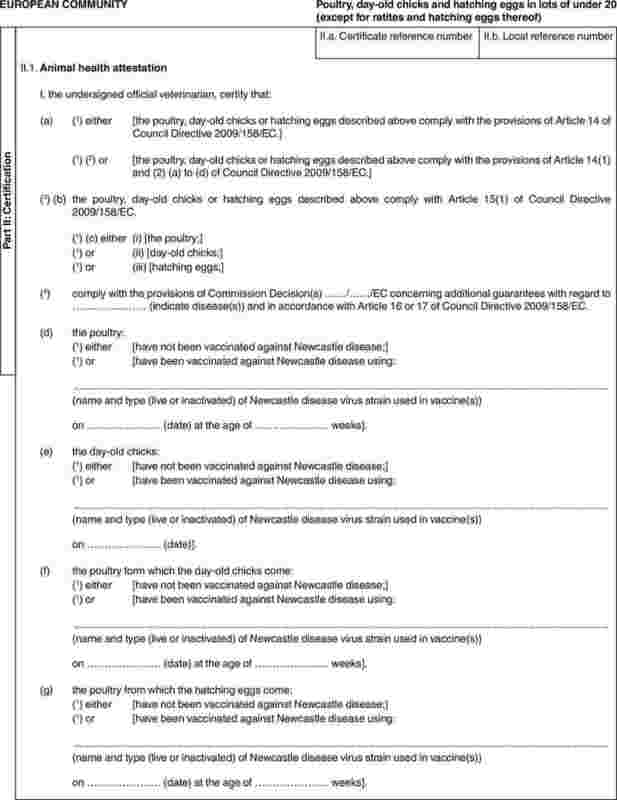 If a Member State or a region or regions of Member State wish to be established as Newcastle disease non-vaccinating they may present a programme as referred to in Article 16(1). The Commission shall examine the programmes presented by the Member States. The programmes may be approved, in compliance with the criteria referred to in Article 16(1), in accordance with the procedure referred to in Article 33(2). Any additional guarantees, general or specific, which may be required in intra-Community trade may be defined in accordance with the same procedure. 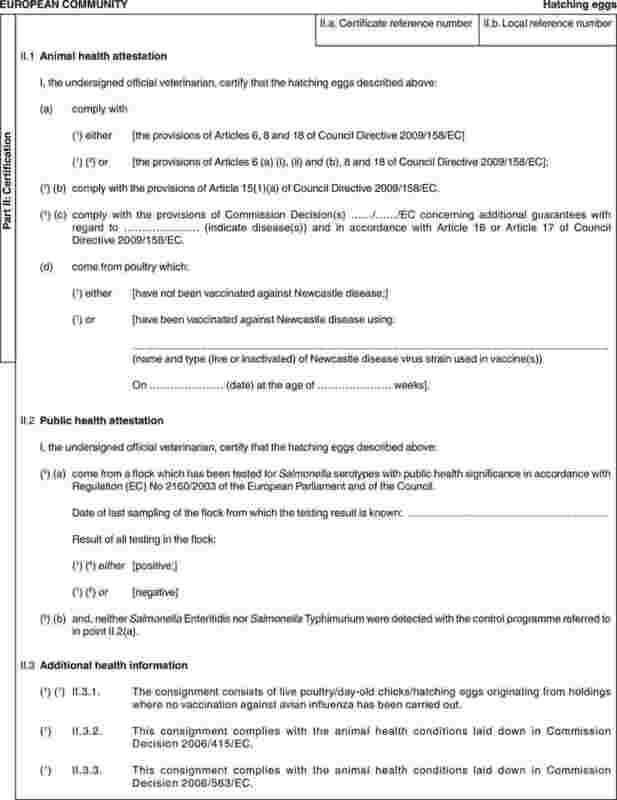 Where a Member State or a region of a Member State considers it has achieved Newcastle disease non-vaccinating status, an application may be made to the Commission for Newcastle disease non-vaccinating status to be established in accordance with the procedure referred to in Article 33(2). 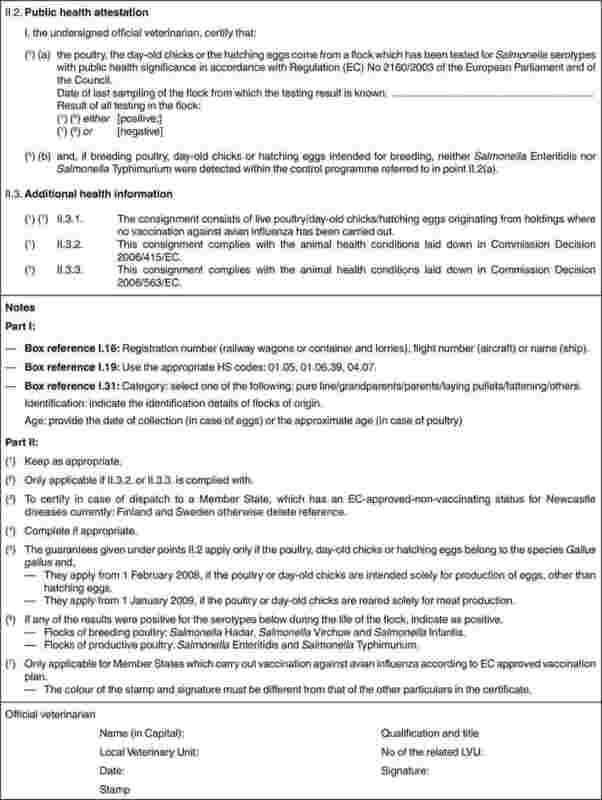 the holdings shall contain no poultry which has been vaccinated against Newcastle disease in the previous 12 months, with the exception of racing pigeons vaccinated pursuant to Article 17(3) of Directive 92/66/EEC. the removal of the legislative restrictions prohibiting systematic recourse to routine vaccination against Newcastle disease. the measures to be taken if the results of the tests carried out in accordance with the provisions of the programme are positive. 2. The Commission shall examine the programmes presented by the Member States. The programmes may be approved, in compliance with the criteria referred to in paragraph 1, in accordance with the procedure referred to in Article 33(2). Any additional guarantees, general or specific, which may be required in intra-Community trade may be defined in accordance with the same procedure. Such guarantees shall not exceed those required by the Member State in its own territory. 3. Programmes submitted by Member States may be amended or supplemented in accordance with the procedure referred to in Article 33(2). Amendments or additions to programmes which have already been approved or to guarantees which have been defined in accordance with paragraph 2 of this Article may be approved in accordance with the same procedure. the arrangements for verifying that the area concerned remains free from the disease. 2. The Commission shall examine documentation submitted by Member States. The additional guarantees, general or specific, which may be required in intra-Community trade may be defined in accordance with the procedure referred to in Article 33(2). Such guarantees shall not exceed those required by the Member State in its own territory. 3. The Member State concerned shall notify the Commission of any change in the particulars specified in paragraph 1. The guarantees defined pursuant to paragraph 2 may, in the light of such notification, be amended or withdrawn in accordance with the procedure referred to in Article 33(2). containers which may be re-used provided they are cleaned and disinfected beforehand. the poultry species to which the eggs or chicks belong. 3. Boxes holding day-old chicks or hatching eggs may be grouped for transport in appropriate containers. The number of boxes thus grouped and the indications referred to in paragraph 2(b) shall be shown on those containers. bearing the approval number of the establishment of origin as provided for in Annex II, Chapter I(2). 5. Breeding and productive poultry and day-old chicks shall be conveyed without delay to the establishment of destination, without coming into contact with other live birds, except breeding and productive poultry or day-old chicks satisfying the conditions laid down in this Directive. Slaughter poultry shall be conveyed without delay to the slaughterhouse of destination, without coming into contact with other poultry, except slaughter poultry satisfying the conditions laid down in this Directive. Poultry intended for restocking supplies of game shall be conveyed without delay to the point of destination without coming into contact with other poultry except poultry intended for restocking supplies of game satisfying the conditions laid down in this Directive. 7. The vehicles and, if they are not disposable, the containers, crates and cages shall, before loading and unloading, be cleansed and disinfected in accordance with the instructions of the competent authority of the Member State concerned. 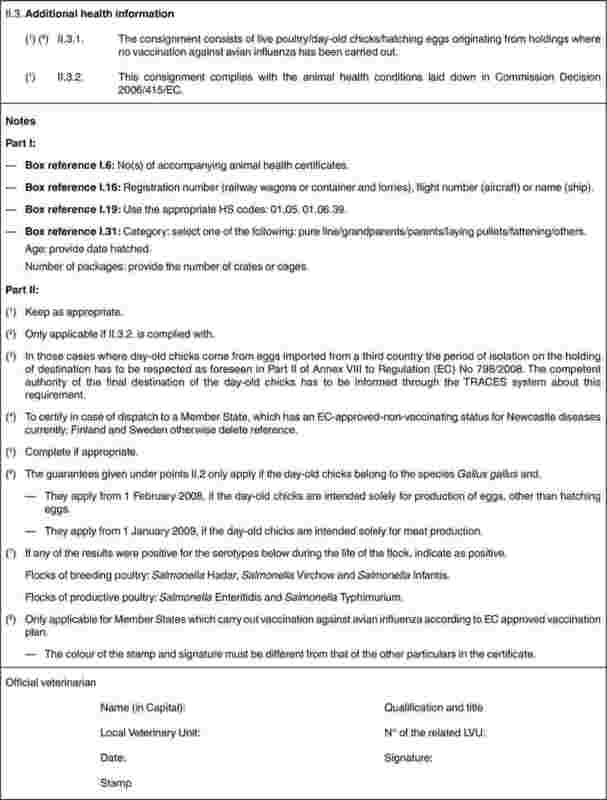 Poultry as referred to in Article 18(5) may not be transported through areas infected with avian influenza or Newcastle disease, unless by trunk road or rail. bears a stamp and a signature of a different colour from that of the certificate. The Member States of destination may, in compliance with the general provisions of the Treaty, grant one or more Member States of dispatch general authorisations or authorisations limited to specific cases permitting entry into their territory of poultry and hatching eggs without the certificate provided for in Article 20. Poultry and hatching eggs imported into the Community shall satisfy the conditions laid down in Articles 23 to 26. 1. Poultry and hatching eggs shall have originated in a third country or part of a third country included on a list drawn up by the Commission in accordance with the procedure referred to in Article 33(2). That list may be supplemented or amended in accordance with the procedure referred to in Article 33(3). compliance with Community rules on hormones and residues. 3. The list referred to in paragraph 1 and any amendments thereto shall be published in the Official Journal of the European Union. which, although they are not free from these diseases, apply measures to control them which are at least equivalent to those laid down in Directives 2005/94/EC and 92/66/EEC respectively. 2. The Commission may, in accordance with the procedure referred to in Article 33(2), decide under which conditions paragraph 1 of this Article is to apply only to a part of the territory of third countries. satisfy the animal health conditions adopted in accordance with the procedure referred to in Article 33(2) for imports of poultry and hatching eggs from the country in question. The conditions may differ according to the species or category of poultry. 2. The animal health conditions shall be determined on the basis of the rules laid down in Chapter II and its corresponding Annexes. In accordance with the procedure referred to in Article 33(2), derogations may be granted on a case-by-case basis if the third country concerned offers similar animal health guarantees which are at least equivalent. 1. Poultry and hatching eggs shall be accompanied by a certificate drawn up and signed by an official veterinarian of the exporting third country. bear a stamp and a signature of a different colour from that of the certificate. 2. The certificate referred to in paragraph 1 shall comply with a model drawn up in accordance with the procedure referred to in Article 33(2). On-the-spot inspections shall be carried out by veterinary experts of the Member States and the Commission to ensure that all the provisions of this Directive are effectively applied. The Member States’ experts responsible for those inspections shall be designated by the Commission on proposals from the Member States. The inspections shall be carried out on behalf of the Community, and the latter shall bear the costs thereof. The frequency of the inspections and the inspection procedure shall be determined in accordance with the procedure referred to in Article 33(2). 1. The Commission may, in accordance with the procedure referred to in Article 33(3), decide that imports from a third country or part of a third country are to be confined to particular species, to hatching eggs, to breeding or productive poultry, to slaughter poultry or to poultry intended for special purposes. 2. The Commission may, in accordance with the procedure referred to in Article 33(2), determine that the imported poultry, hatching eggs or poultry hatched from imported eggs is to be kept quarantined or isolated for a period which may not exceed two months. Notwithstanding Articles 22, 24, 25 and 26, the Commission may, in accordance with the procedure referred to in Article 33(2), decide to permit on a case-by-case basis the importation of poultry and hatching eggs from third countries where such imports do not conform to the provisions of Articles 22, 24, 25 and 26. Detailed rules for such importation shall be drawn up at the same time in accordance with the same procedure. Such rules shall offer animal health guarantees at least equivalent to the animal health guarantees offered by Chapter II, involving compulsory quarantine and testing for avian influenza, Newcastle disease and any other relevant disease. On arrival in the Member State of destination, slaughter poultry shall be taken directly to a slaughterhouse for slaughter as soon as possible. Without prejudice to any special conditions which may be adopted in accordance with the procedure referred to in Article 33(3), the competent authority of the Member State of destination may, on animal-health grounds, designate the slaughterhouse to which the poultry must be conveyed. 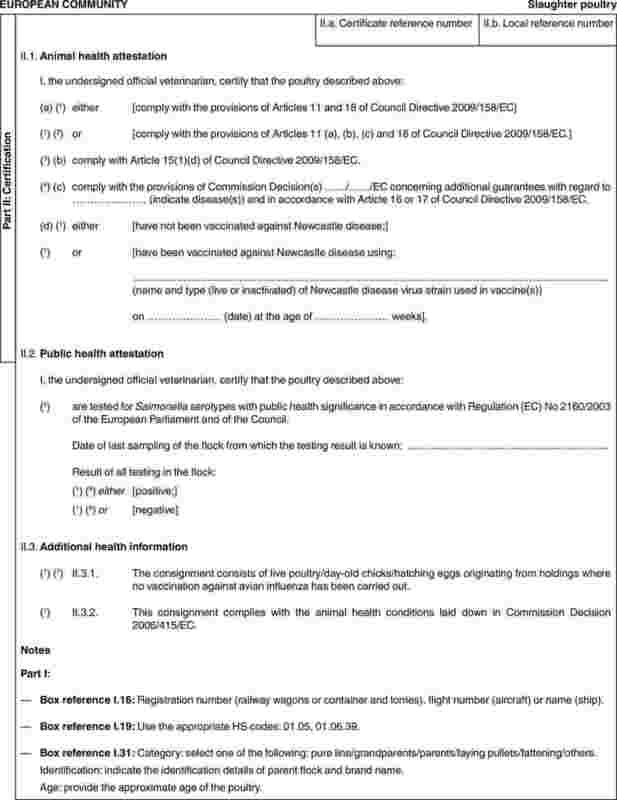 For the purposes of intra-Community trade, the safeguard measures provided for in Council Directive 89/662/EEC of 11 December 1989 concerning veterinary checks in intra-Community trade with a view to the completion of the internal market (14) shall apply to poultry and hatching eggs. The veterinary control rules provided for by Directive 90/425/EEC shall apply to intra-Community trade in poultry and hatching eggs. 1. The Commission shall be assisted by the Standing Committee on the Food Chain and Animal Health set up pursuant to Article 58 of Regulation (EC) No 178/2002 of the European Parliament and of the Council of 28 January 2002 laying down the general principles and requirements of food law, establishing the European Food Safety Authority and laying down procedures in matters of food safety (15). 3. Where reference is made to this paragraph, Articles 5 and 7 of Decision 1999/468/EC shall apply. The period laid down in Article 5(6) of Decision 1999/468/EC shall be set at 15 days. Amendments to Annexes I to V, particularly in order to adapt them to changes in diagnostic methods and to variations in the economic importance of particular diseases, shall be decided in accordance with the procedure referred to in Article 33(2). Member States shall communicate to the Commission the text of the provisions of national law which they adopt in the field covered by this Directive. Directive 90/539/EEC, as amended by the acts listed in Annex VI, Part A, is repealed, without prejudice to the obligations of the Member States relating to the time-limits for transposition into national law of the Directives set out in Annex VI, Part B. (1) Opinion of 20 October 2009 (not yet published in the Official Journal). (2) OJ L 303, 31.10.1990, p. 6. (3) See Annex VI, Part A. (4) OJ L 299, 16.11.2007, p. 1. (5) OJ L 168, 28.6.2008, p. 5. (6) OJ L 224, 18.8.1990, p. 29. (8) OJ L 139, 30.4.2004, p. 321. (9) OJ L 378, 31.12.1982, p. 58. (10) OJ L 243, 11.10.1995, p. 25. (11) OJ L 260, 5.9.1992, p. 1. (12) OJ L 94, 31.3.2004, p. 44. (13) OJ L 10, 14.1.2006, p. 16. (14) OJ L 395, 30.12.1989, p. 13. (15) OJ L 31, 1.2.2002, p. 1.
they shall organise periodic comparative tests. 2. The competent authority shall give each establishment which complies with the conditions laid down in point 1 a distinguishing number, which may be the same as that given pursuant to Regulation (EC) No 1234/2007. The setting and layout of the facilities must be compatible with the type of production pursued, ensuring that the introduction of disease can be prevented or, if an outbreak occurs, that it can be controlled. If an establishment houses several species of poultry, there must be a clear separation between them. The facilities must provide good conditions of hygiene and allow health monitoring to be carried out. The equipment must be compatible with the type of production pursued, and allow cleansing and disinfection of the facilities and of vehicles for transporting poultry and eggs at the most suitable spot. Rearing techniques must be based as far as possible on the ‘protected rearing’ principle and on the ‘all-in/all-out’ principle. Cleansing, disinfection and depopulation must be carried out between batches. Hygiene rules must be drawn up by the management of the establishment; personnel must wear appropriate working clothing and visitors protective clothing. Buildings, pens and equipment must be kept in good repair. Eggs must be collected several times a day, and must be clean and be disinfected as soon as possible. The farmer must notify the authorised veterinarian of any variation in production performance or any other sign suggesting the presence of a contagious poultry disease. As soon as disease is suspected, the authorised veterinarian must send the samples needed for making or confirming the diagnosis to an approved laboratory. Where a contagious poultry disease occurs, the results of laboratory tests must be communicated immediately to the authorised veterinarian. Buildings must be protected against birds coming from outside and rodents; floors and walls must be of hard-wearing, impervious and washable materials; natural or artificial lighting and air flow and temperature systems must be of an appropriate type; provision must be made for the hygienic evacuation of waste (eggs and chicks). Equipment must have smooth and waterproof surfaces. Operation must be based on a one-way circuit for eggs, mobile equipment and personnel. Buildings and equipment must be kept in good repair. A programme of microbiological quality control must be used to assess the health status of the hatchery. The farmer must notify the authorised veterinarian of any variation in production performance or any other sign suggesting the presence of a contagious poultry disease. As soon as contagious disease is suspected, the authorised veterinarian must send the samples needed for making or confirming the diagnosis to an approved laboratory and inform the competent veterinary authority, which shall decide on appropriate measures to be taken. Without prejudice to health measures and to Articles 16 and 17, disease surveillance programmes must, as a minimum, comprise surveillance of the infections and species listed below. Salmonella pullorum et gallinarum: fowls, turkeys, guinea fowls, quails, pheasants, partridges and ducks. Serological and/or bacteriological tests must be used to determine whether an infection is present. Samples for testing must be taken, as appropriate, from blood, second-grade chicks, down or dust taken from hatchers, swabs taken from the walls of the hatchery, litter or water from a drinker. When blood samples are taken from a flock for serological testing for Salmonella pullorum or Salmonella arizonae, prevalence of infection in the country concerned and its past incidence in the establishment must be allowed for in determining the number of samples to be taken. Flocks must be inspected during each laying period at the best time for detecting the disease. Mycoplasma gallisepticum: fowls and turkeys. Presence of infection must be tested by serological and/or bacteriological testing and/or by the presence of air sacculitis lesions in day-old chicks and turkey poults. Samples for testing must be taken, as appropriate, from blood, day-old chicks and turkey poults, sperm, or swabs taken from the trachea, the cloaca or air sacs. Tests for detecting Mycoplasma gallisepticum or Mycoplasma meleagridis must be performed on a representative sample in order to allow continuous surveillance of the infection during rearing and laying, i.e. just before the start of laying and every three months thereafter. If there are no reactors, the test is deemed negative. Otherwise, the flock is suspect and the measures specified in Chapter IV must be applied to it. D. In the case of holdings which consist of two or more separate production units, the competent veterinary authority may derogate from these measures as regards healthy production units on a holding which is infected provided that the authorised veterinarian has confirmed that the structure and size of these production units and the operations carried out there are such that the production units provide completely separate facilities for housing, keeping and feeding, so that the disease in question cannot spread from one production unit to another. until completion of the appropriate measures required by the official veterinarian, if the establishment is found not to conform with the requirements of Chapter I, point 1(a), (b) and (c). if, after a second notice served by the official veterinarian, action to bring the establishment into line with the requirements of Chapter I, point 1(a), (b) and (c), has not been taken. 1. 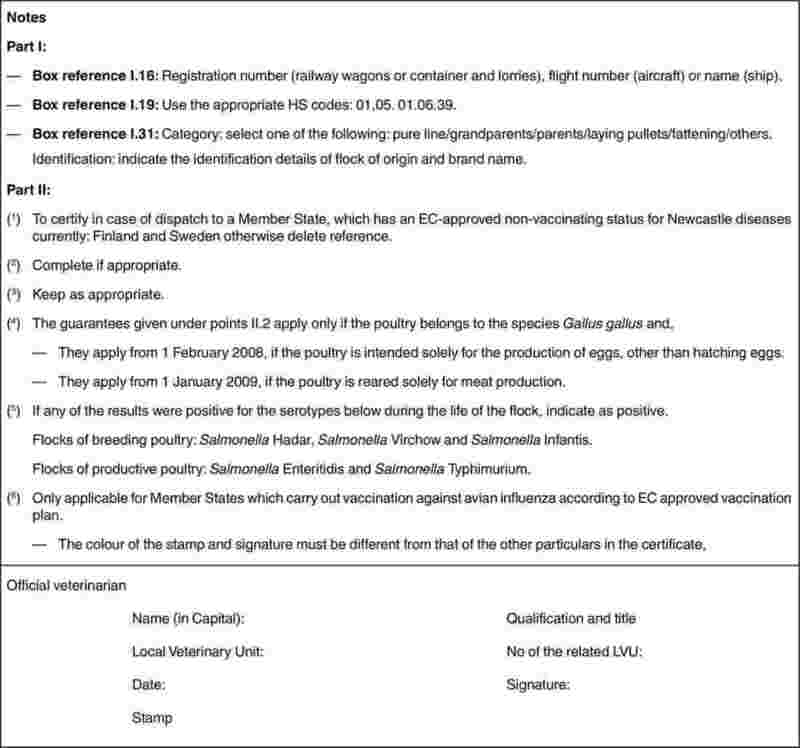 Vaccines used for vaccinating poultry or flocks producing hatching eggs must have a marketing authorisation issued by the competent authority of the Member State in which the vaccine is used. 2. 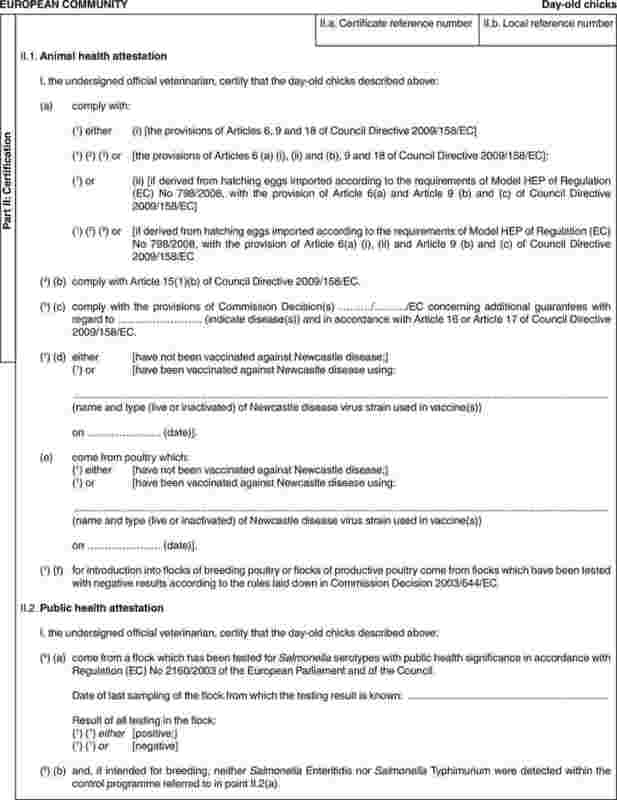 The criteria for using vaccines against Newcastle disease in the context of routine-vaccination programmes may be determined by the Commission. (OJ L 303, 31.10.1990, p. 6). (OJ L 268, 24.9.1991, p. 35). (OJ L 268, 24.9.1991, p. 56). (OJ L 268, 14.9.1992, p. 54). (OJ L 195, 14.7.1992, p. 25). (OJ L 340, 31.12.1993, p. 35). (OJ C 241, 29.8.1994, p. 132). (OJ L 300, 23.11.1999, p. 19). (OJ L 201, 9.8.2000, p. 8). (OJ L 323, 7.12.2001, p. 29). (OJ L 122, 16.5.2003, p. 1). (OJ L 236, 23.9.2003, p. 381). (OJ L 363, 20.12.2006, p. 352). (OJ L 346, 9.12.2006, p. 41). (OJ L 227, 31.8.2007, p. 33). (OJ L 294, 13.11.2007, p. 26). (OJ L 219, 14.8.2008, p. 40).